Install Python and Java before installing Eclipse. You may want to print these instructions before proceeding, so that you can refer to them while downloading and installing Eclipse. Or, just keep this document in your browser. You should read each step completely before performing the action that it describes. 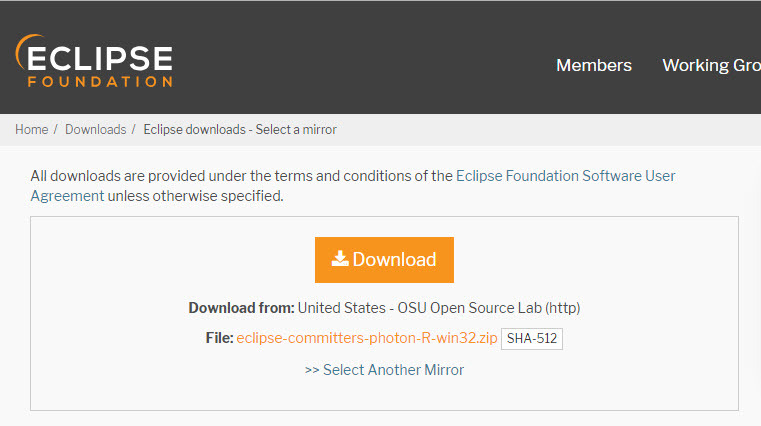 This document shows downloading and installing Eclipse (Photon) on Windows 7 in Summer 2018. 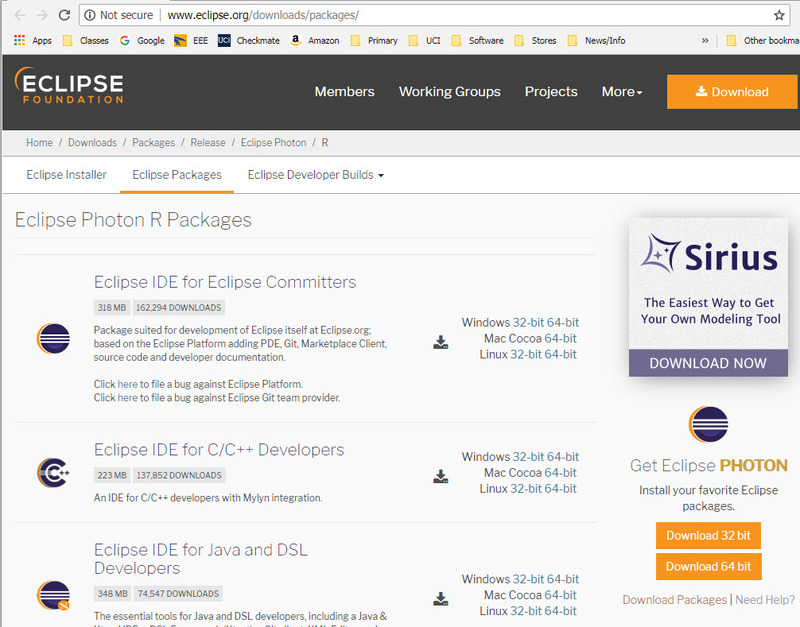 You should download and install the latest version of Eclipse. The current latest (as of Winter 2019) is Eclipse 2018-12. Remember that you must install Java, Python, and Eclipse as all 32-bit or all 64-bit. I recommend using the 32-bit verisons for each. The Eclipse download requires about 320 MB of disk space; keep it on your machine, in case you need to re-install Eclipse. When installed, Eclipse requires an additional 350 MB of disk space. The following page will appear in your browser. In this handout we will download Eclipse IDE for Eclipse Committers for Windows 32 Bit; if your computer uses Windows, continue below; otherwise choose either Mac Cocoa or Linux instead. It is critical that Java, Python, and Eclipse are either all 32 Bit or are all 64 Bit (and the, only if your Machine/OS supports 64 Bit): I think it easiest to use 32 Bit for everything. Click the 32-Bit (after Windows) to the right of the Eclipse IDE for Eclipse Committers; this version may appear on the top of the list, or may appear further down. You will see the following page (don't worry about the name of the institution underneath the orange DOWNLOAD button). Click the orange DOWNLOAD button. The site named here, beneath the button: United States - OSU Opoen Source Lab (http) is the random one chosen by the download page this time; yours may differ. Terminate the tab browsing this webpage. Move this file to a more permanent location, so that you can install Eclipse (and reinstall it later, if necessary). Start the Installing instructions directly below. 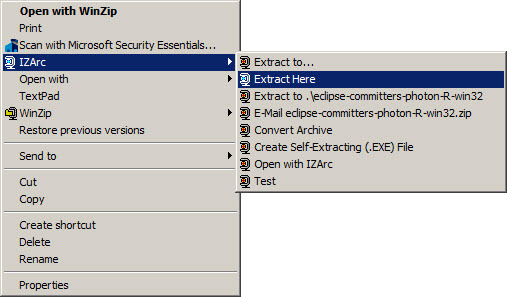 Unzip eclipse-committers-photon-win32.zip, the file that you just downloaded and moved. Hover over the IZArc command from the menu of options. If you do not have IZArc or an equivalent unzipping program, here is the web site to download a free copy of IZarc. Unzipping this file creates a folder named eclipse; unzipping 250 MB can take a few minutes. You can leave this folder here or move it elsewhere on your hard disk. I recommend putting the downloaded file and resulting folder in the C:\Program Files\ directory. Drag it to the desktop. Now you are ready to perform a one-time only setup of Eclipse on your machine. Double-click the shortcut to Eclipse that you just created above.